Our Premier vessel (B5) is a RODMAN 44 MUSE, which is capable of carrying 10 passengers and 2 crew. At nearly 50 feet in length 'B5 or True Colours' is competitively priced her to match even some of the smaller charter boat prices out there. 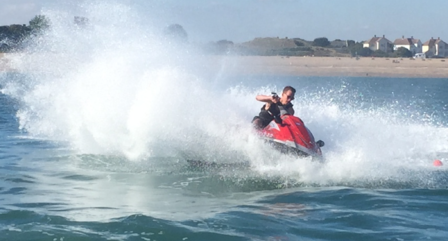 In addition, if you are planning a charter why not also consider taking some Rigid Inflatables along for a bit of high speed fun and memorable day out. Our hire packages are ideal for perhaps the marriage proposal you want your partner to remember forever, or a private wedding reception, birthday party, business meetings, PR, films, product launches, office parties, etc. So whether you are looking to host a corporate event or celebration we would be delighted to assist you in providing a trip for everyone to remember. Training on "True Colours" - International Certificate of Competence (ICC). If you are looking to obtain your Power Over 10 metre International Certificate of Competence / ICC then this is the boat you will most likely be on. 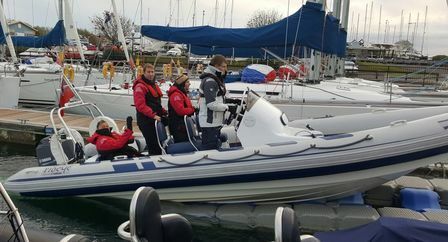 The ICC for this size of boat can be obtained in a few ways; via a direct assessment, which some people like a days refresher training prior to brush away the cobwebs or the RYA Day Skipper Theory / Practical training package. 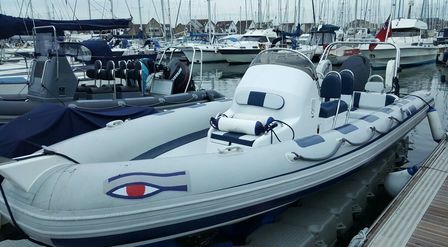 B1 our new Ribeye Rigid Inflatable Boat (RIB) measures in at a respectable 6.5 metres. 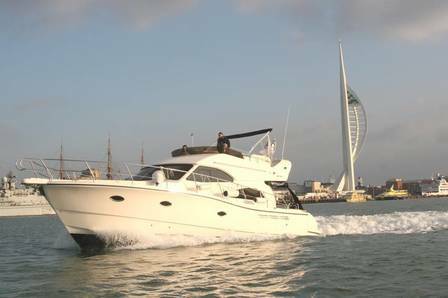 With the ability to carry 8 persons onboard and with a top speed of 40+ knots, she certainly doesn't hang about either... Loaded with the most advanced technology and instruments, she is ready now for teaching and charters all year round. Recently, B1 has had a few modifications to her to make her more student friendly and intuitive. For starters, her throttle normally placed on the right side of the centre console with the Ribeye Ribs it was difficult for instructors to help students with demonstrations, as they couldn't see or control the throttle. So after a day at the workshop the throttle had been moved to the centre of the console, making it easier for demonstrations to be observed by the students. The main benefit is she is now safer for the instructor, allowing them to quickly take control in the unlikely event of an incident. Being fitted with the latest technology this is proving to be a great benefit to students who particularly want to navigate with electronics. As a result her centre console is now fitted with the latest Raymarine touch screen chart plotter and i70, which are intuitive and easy to use especially for beginners; a fantastic training aid! Being a sea school one advantage the new Evinrude 150 hp 2-stroke has to offer is that it only requires a service every 300 hours! As one can imagine for a company that averages between 300-500 hours a year we need an engine that is reliable and durable, so are keen to see how the engine measures up. But as we always tell our students, ' If you look after them they will look after you...; For example our Suzuki 90 fitted to the NAB Dory is approaching 4000 hours and still going strong! One of our favourites, 'Adaptable / B3' is still earning her keep as well as keeping students safe. As well as acting as a camera boat for the 2012 Olympics she has assisted numerous students in passing the RYA Level 2 powerboat course and attaining the ICC. 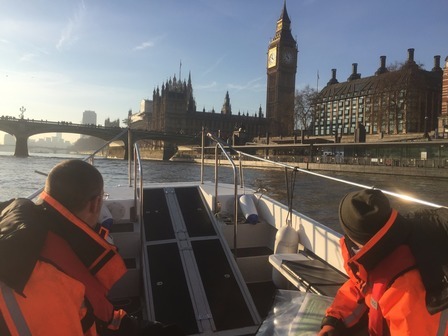 She has recently been involved in bridge inspections, safety boat work around the country and her lasted role is acting as a safety boat for a couple of companies working on the massive Thames Tideway Project. B4, or 'Miss Isle' to her friends, is always kept busy during the summer months but please note she still needs a run in the winter, and if using one of our dry suits you don't feel the cold either. So don't get put off doing a RYA PWC course to get yourself an PWC International Certificate of Competence (ICC). Information entered into this form is sent via email to our team. None of the above data is shared or stored on the website. It will be used to respond to your request for more information and a record of this will be stored in salesforce.com.